NETWORK FINALS: There were no changes from Friday’s preliminary network ratings. CABLE HIGHLIGHTS: Discovery’s GOLD RUSH remained at the top of Friday cable, up a tick to 1.07, and lead-out THE WHEEL was up 0.07 to 0.43. HBO’s REAL TIME WITH BILL MAHER climbed 0.03 to 0.49. ESPN’s NBA doubleheader featured Chicago vs. Phoenix at 0.48, and Indiana vs. Washington at 0.41. On Lifetime, THE RAP GAME edged up 0.02 to 0.42, and BRING IT held at 0.40. HGTV’s HOUSE HUNTERS gained 0.07 to 0.37, and MY LOTTERY DREAM HOUSE was down 0.03 to 0.31, with HOUSE HUNTERS INTL steady at 0.29. Disney Channel’s 11AM SOFIA THE FIRST hit the Top 10 at 0.34. A&E’s LIVE PD rose 0.03 to 0.34. 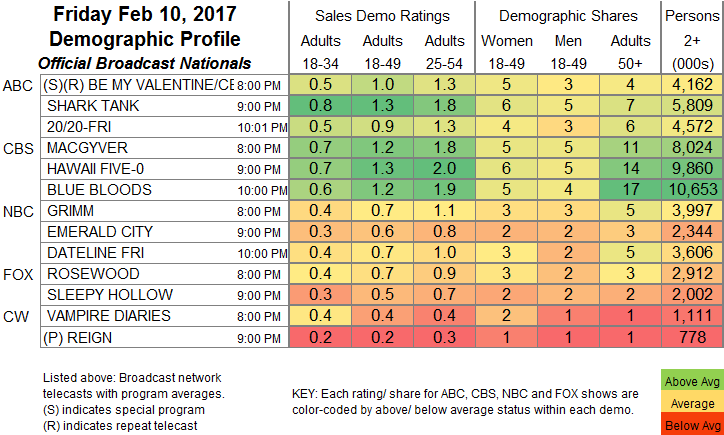 Bravo’s MARRIED TO MEDICINE climbed 0.05 to 0.34. Food Network’s DINERS, DRIVE-INS & DIVES was at 0.33, and GINORMOUS FOOD stayed at 0.30. 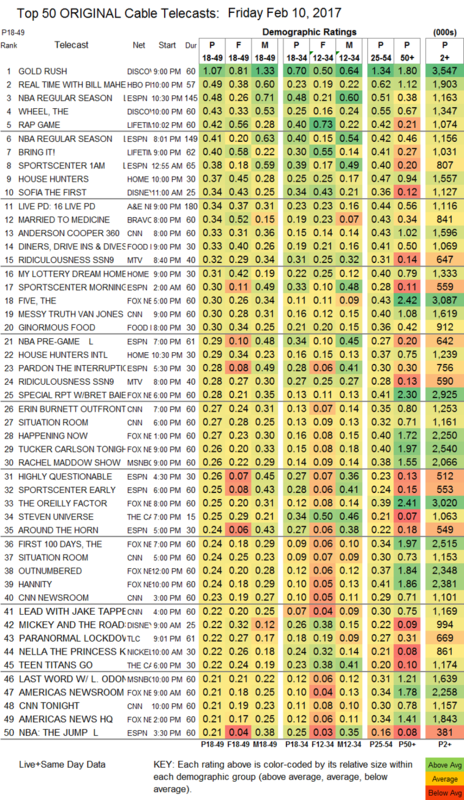 On MTV, RIDICULOUSNESS was at 0.32/0.28, compared to last week’s 0.28/0.24. TLC’s PARANORMAL LOCKDOWN gained 0.02 to 0.22, and the UNLOCKED after-show remained at 0.17. We’s MARRIAGE BOOT CAMP ticked down to 0.16.